The big announcement was the Pixel 3, Google’s latest smartphone; in fact, many reporters referred to the whole shindig as “the Pixel 3 event.” It comes in regular and XL sizes, with 5.5 and 6.3 inch screens respectively. Both screens have a “notch” around the 12.2-megapixel rear-facing camera, an Apple design innovation that forced many app developers to redesign their displays. Both Pixels are water-resistant, come with 4 GB of memory, and their speakers are 40% louder so you and the whole bus can hear the two free months of YouTube Music that comes with every Pixel. That's helpful, right? Other helpful touches include “Top Shot” software that helps shutterbugs take better pictures. It can take shots before and after you press the shutter, so you can choose the one with the best timing. “Super Res Zoom” enhances optical zoom to bring images closer with less blurring. “NightSight” lightens dark photos without a flash. All Pixel phones will soon get these software upgrades. The Pixel 3 also has a second front-facing camera just for group selfies (or "groupies", as Google calls them). Google says it captures “184% more of the shot” than Apple’s iPhone Xs. “Call Screen” is an AI-based feature handles suspected spam calls for you. “Flip to shush” turns off notifications when the phone is turned face-down. Both are helpful. A new charging dock acts as an alarm, music player, voice assistant, and photo frame. It is a scaled-down version of Home Hub, the next new helpful thing. No doubt this Pixel charger is meant to whet your appetite for a Home Hub. The Pixel 3 phone starts at $379; the charger is $79. Verizon and Google will sell Pixel phones in red, white, and pink starting October 18, 2018. Google Home Hub is a smart speaker with a screen, like Amazon Show. The voice-controlled device has a 7-inch touchscreen. It can control smart-home devices, answer questions, display photos, and show videos streamed from the web. That’s all helpful but every smart speaker does the same things. What is most helpful about Home Hub is what it lacks that every competitor has: a camera! That helps make Home Hub $80 cheaper than its Amazon equivalent ($149), and helps allay privacy concerns. The Pixel Slate tablet is a totally new genre for Google. It runs the first version of Google’s Chrome operating system designed for tablets. You can binge-watch Netflix in bed with Slate’s duo of speakers and high-resolution display. Unlike the Hub, it features a front-facing wide-angle camera, I wonder what the wide angle helps. More selfies, I'll guess. Slate is not another Android device. It runs a full-blown version of Google’s Chrome Internet-centric operating system, of which the Chrome browser is but one component. Slate can run Chrome apps that Android can’t, and do things that the browser can’t. Still, Google expects most users to rely heavily on the browser, so it supports “as many tabs as you want,’ according to the company. Slate’s physical design is more helpful than most. Its keyboard cover can be locked at any angle, where others tend to lock at just one. The case attaches to Slate’s back with magnets, providing full-spectrum angling there too. The tablet costs $599, the cover $199, and a compatible stylus is $99; so about $900 if you go all-in. Taking a page from Henry Ford's playbook, you can have any color you want, as long as it's midnight blue. The humble Chromecast streaming video dongle got a slight redesign that was not worthy of a spot at this new-product event. It still costs $35 and still streams 1080p. 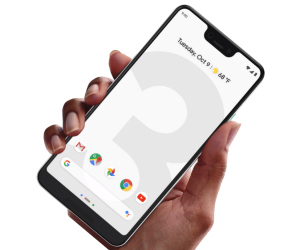 Most recent comments on "[RECAP] Google's 2018 Hardware Event"
Where can I buy a Pixel 3 for $379? Not Pixel 3, 1st edition that will only be supported (security updates) through October 2019. The 5.5” screen does not have a notch. Instead, it has a bezel at the top. Hope these work better than the Nest Hello doorbell I foolishly purchased. I can get to the door faster than any notification comes to me on my phone. Plus it spends as much time offline as on line. @ Ken H. Your link was from an article in July. That offer is no longer available. Google hub is $149 on your link not the $80 you have listed. Please correct the article. Bob I misread your article. Apologies it say 149 and is 80 cheaper! Have a great day and keep up the good work!